Between 17 and 20 September, Gastech, the world’s most important gas industry event, was held. Although this is a key event on the calendar, it was even more special for us this year because, for the second time in its history, it was hosted by a Spanish city. While visitors were welcomed to Bilbao for the event in 2005, this year it was the turn of Barcelona to offer us its hospitality. Barcelona has always played an important part in the history of natural gas in Spain. It was the city where, 50 years ago, the first LNG terminal in continental Europe was built. Behind that decision was Pere Duran Farell, with whom I had the pleasure of working at the start of my career. He was a visionary who, at the end of the 1960s, understood the role that natural gas was going to play in the economy and in society as a whole, and paved the way for its introduction to the whole of Spain. The Barcelona plant today sets the standards for safety and innovation, and Spain is the one of the countries with the most regasification terminals and one of the most diversified supply networks in the world. With this history behind it, Barcelona was the perfect setting for Gastech 2018 and, for a few days, was the gas capital of the world. 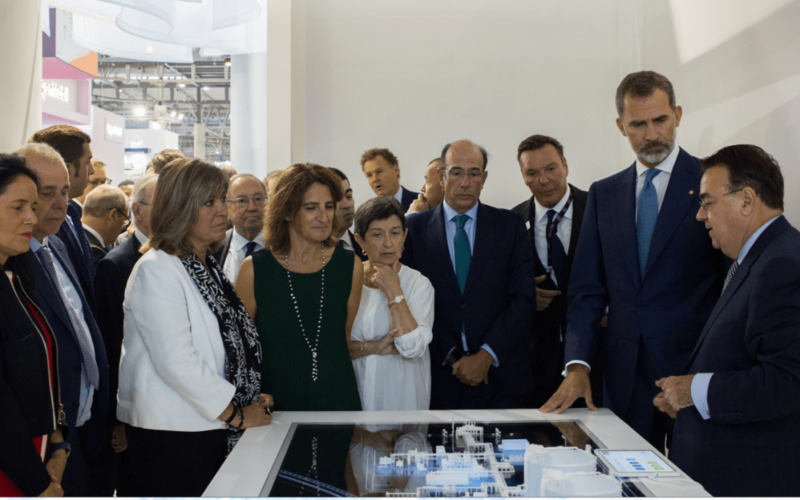 The event was officially opened by His Majesty King Felipe VI of Spain. It was a great honour for me to take part in the opening panel discussion, seated at a round table with five executives from the largest Spanish companies. Scarcely have a few days passed since the event closed and the results could not have been more positive. I believe the people entrusted with its organisation have done excellent work to meet an extremely daunting challenge. The figures are impressive: more than 30,000 visitors; 700 stands; participants from more than 90 countries; 16 national pavilions; and more than 350 high-level speakers. Enagás played an active role in this edition. Several of our experts took part in the discussion panels and scheduled debates, among then our CEO Marcelino Oreja, who opened Wednesday’s proceedings as a member of the round table discussion that dealt with one of the main topics of this year’s edition, non-electric renewable energies. The gas sector is working to inform society of an important prospect for the future of energy: the role of natural gas in energy transition. In the fight against climate change and the emission of greenhouse gases, individual solutions are not working. If each of us works on our own, we will all fail. This is why events such as Gastech are so important. First of all, they are a meeting place where we can share our knowledge and experience with other players in the sector. Moreover, conferences such as this allow us to debate the challenges posed by decarbonisation. This edition was a magnificent opportunity to see how the world’s leading companies are facing this new era.